These are several of the DECtape and related tapes. The green LINCtape was the for the older LINC-8 also this and PDP-12 computers. They are written in the opposite direction on the tape and use a somewhat different format. The box labeled micro tape 555 was for the early DECtape drives developed for the PDP-5, a predecessor to the PDP-8. The blue DECtape is the later style. The actual reel of tape inside all look the same except for the LINCtape is wound on the reel in the opposite direction. 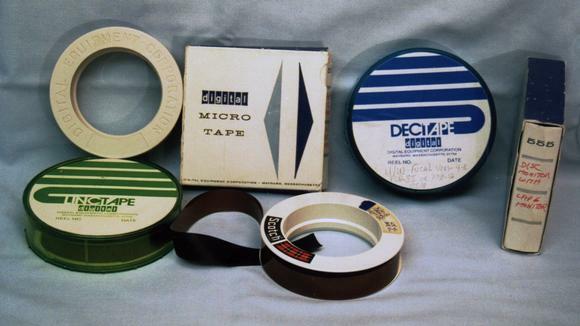 Other companies also made DECtape compatible tapes such as the Scotch tape in the foreground.